Donkey Kong preparing to fight Ninja Kong. 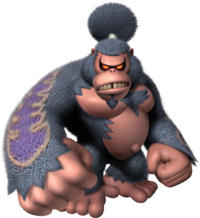 Ninja Kong is a large burly Kong, member of the Evil Kings, and the third Kong boss fought in the game Donkey Kong Jungle Beat. 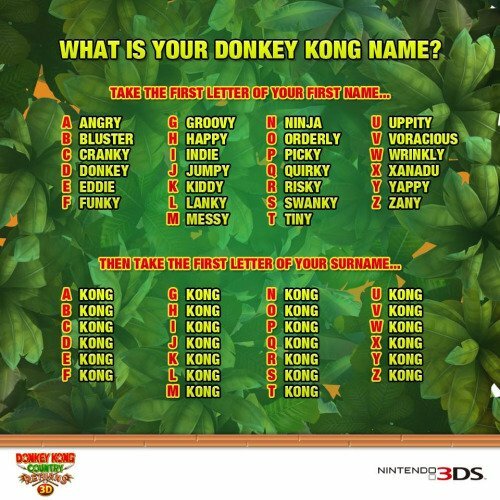 Ninja Kong is the ruler of the Durian Kingdom, which is the twelfth kingdom Donkey Kong ventures through. Ninja Kong is one of the most physically powerful of all Donkey Kong's enemies, making the battle against him more difficult than usual. Nevertheless, Donkey Kong still manages to defeat him and goes on to battle the evil Cactus King. Ninja Kong later appears at the game's ending ceremony where he, along with the other Evil Kings, honors Donkey Kong's victory over the Ghastly King. Ninja Kong appears as a Spirit in Super Smash Bros. Ultimate. Bushidō Kongu Bushidō Kong;「武士道」Bushidō means "way of warrior", and refers to the traditional lifestyle of the samurai. French Bushido Kong Transliteration of the Japanese name. Italian Kong Fu onomatopoeia to "Konfu"
The in-game files refer to him as "Miyamoto," not as in series-creator Shigeru Miyamoto, but rather Miyamoto Musashi, a wandering samurai warrior during the era of Japan's warring states. Ninja Kong's name was referenced in an imageMedia:DKC Returns 3D DKC cartoon reference.jpeg posted by Nintendo UK to promote Donkey Kong Country Returns 3D. This page was last edited on April 13, 2019, at 16:47.